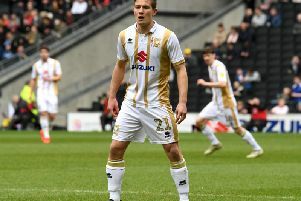 Ben Reeves scored a dramatic late equaliser to rescue a point for a drab MK Dons against Rochdale on Saturday, drawing 2-2. The visitors could count themselves somewhat unlucky not to pick up their first win since January, but despite having four excellent chances to put the game to bed in the first half, they only had Steven Davies' header to claim the lead. Dons looked lifeless until the introduction of Kieran Agard on the hour, and he poked home Ben Tilney's cross with 19 minutes to go to get Dons level. But a crucial missed tackle from Ed Upson appeared to give Rochdale all three points as Nathaniel Mendez-Laing coolly beat David Martin with five minutes to go, before Reeves' strike in stoppage time snatched a point at the death. Without suspended Dean Lewington and George Baldock, Ben Tilney returned to the side as Robbie Neilson reverted to four at the back. With Chuks Aneke ruled out for the rest of the season, Nicky Maynard and Robbie Muirhead lead the line, while Stuart O'Keefe replaced Darren Potter in the centre of the park. The visitors hadn't won a game since January 7 before kick off, but did the majority of the pressing in the early stages as Dons looked to play on the counter. David Martin was certainly the busier of the two keepers, but despite making two good stops and a commanding punch, the keeper would be at fault as Dale took the lead. There was an element of luck to it though. Calvin Andrew's cross from the right flank caught Martin in No Man's Land, but it also caught out Steven Davies, whose initial header bounced off him and onto the post, but was afforded a simple rebound to head into the empty net. Martin would lose the flight of the ball barely five minutes later too with Davies once again lurking at the far post, only this time the Dale striker would head wide of the mark. His involvement though would end early as he hobbled off after just 25 minutes, replaced by Joe Thompson. The goal appeared to spark Dons into life, and certainly saw them have more of the ball, but chances didn't materialise. Harvey Barnes was proving to have the better of full-back Andrew, but his balls into the mix were twice shy of the mark, while Nicky Maynard's chasing was largely in vain. The visitors could easily have had two more before half time, but a stunning miss from Thompson, hitting over from three yards out, and a low Nathaniel Mendez-Laing effort weren't converted. Barnes was proving to be Dons' only viable outlet, and with little to no support around him, opted to go it alone when he turned his man and saw sight of goal, but pulled his effort just wide - though Dons going in level at the interval would have been harsh on Rochdale. With little change in the second half, Robbie Neilson withdrew Maynard and Muirhead for Kieran Agard and Maecky Ngombo. The changes didn't seem to make much of an impact, but given Rochdale's hapless run of late, there was almost an air of inevitability that Dons would draw level with 19 minutes remaining. Ben Tilney, who had another solid afternoon at left back, joined the attack and after beating his man, whipped the ball across the face of goal. Dale keeper Ben Wilson misjudged it though, and Agard, gambling on it, threw himself at it to prod home the leveller. It looked, from there, as though there would be only one winner as Dons did all the leg work, but a crucial mistake from Ed Upson with five minutes to go gifted Rochdale the lead once again. As the Dons midfielder tried to intercept Callum Camps' ball wide, he missed it completely, allowing Mendez-Laing a clean run on goal. After firing straight at Martin in the first half, he needed no second invitation as he coolly slotted the ball past the keeper. But after their stoppage time heartbreak last week at Millwall, it would be Dons' turn this week as they snatched a point at the death. Ben Reeves, who scored at The Den, picked up the ball on the edge of the box, spun skipper Ian Henderson and fired a fierce strike past Wilson to nick a point.